yanyun chen: Scratch & Sniff! I am very proud to present: Scratch & Sniff! 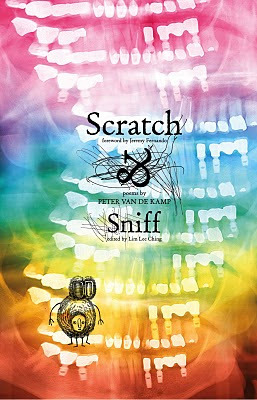 A poetry book by Peter van de Kamp, edited by Lim Lee Ching and foreword by Jeremy Fernando, with illustrations by Sara Chong and myself. Published by Atropos. I did the layout for the book as well, and not being trained in graphic design or book design, it was a bit of a struggle and fast paced learning-on-the-job experience. I had a lot of fun, made a ton of mistakes, got closer to typography, learnt more about printing and publishing, and opened myself to a new world of design outside animation. A great project to be part of, a big thank you to the writers for including me in the experience! :D Many thanks to Meng Wong who gave me a quick lesson on typography and his generous supply of typography books. And Chris Toh for his advice on the book cover. And Robert Bringhurst for his "The Elements of Typographic Style" bible.